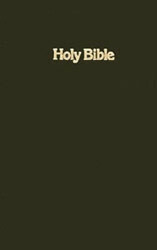 This KJV Ministry/Pew Bible is priced right for use by churches, church schools, institutions, or outreach ministries. Comes in durable hardcover with gold stamping. Includes topical subject headings, and is set up in a double column format in 8 point type.